Here’s some very positive news that could help you advance your career and expand your practice: The proven, powerful Dentox injectables course will be available soon in Boston, giving Massachusetts dentists and doctors the chance to learn from the innovator who created Botox and dermal filler training. And you can train conveniently in the Boston area without having to travel out of state. Lots of details are coming your way, but you can skip down and see the dates and times if you like. Or stay for the whole post and find out about Dentox and our Botox and dermal filler training. This daylong seminar is a unique learning opportunity that isn’t offered in Boston often, so please don’t miss this upcoming chance. You get Botox training, dermal filler training and more – plenty to help you create a lucrative medical aesthetics practice or create a big sideline in injectables at your dental or physician’s office. For most of our seminar participants, the most exciting and enticing opportunity we provide in our Dentox one-day training on Botox and dermal fillers is the new module on PRP – or Platelet-Rich Plasma therapy. This remarkable therapy is gaining acceptance and popularity around the world – so much so that your clients may already be asking for it. To avoid being left behind, get in on it now. As well as being a smart way to plump lines and reduce other signs of aging with a lower cost than dermal fillers, PRP also has therapeutic uses as a way to help patients who have had surgery or an injury recover better and faster. Here’s how PRP works: In your office using a PRP centrifuge – the only major expense involved in this therapy – your patient’s own blood is refined into an injectable that can be used in a way similar to some dermal fillers and also to speed and improve healing. It can even effectively speed bone regeneration. Without parallel as a healing tool and less expensive for you and your patient than dermal fillers, there’s also no risk of allergies. Since PRP injection is new, there aren’t very many places you can learn it. The Dentox Boston Botox and injectables training, however, includes a special module on PRP that provides all the details you need to start providing PRP in your office right away. And that’s just one thing you’ll learn in this seminar. But before we talk about more specifics, let’s get to the schedule. Remember, every module of this daylong event is a mini-seminar, then a hands-on, fully practical session follows at the end. All sections are instructed and led by Dr. Howard Katz, an innovator who created Botox training and PRP training and has been a leader in related fields for years. When you make the lucrative and intelligent decision to take Botox, dermal filler and PRP therapy training in Boston from Dentox, you’re choosing to learn from our lead trainer, Dr. Katz, and benefit from his years of expertise. • And so much more – a full day of training. Rather than sticking you with just any injectables instructor who can fly to Boston, we give you our founder – the founder of Botox training. Every Dentox seminar – including the upcoming one in Boston – is led by Dr. Howard Katz, an innovator, researcher, medical professional and respected name in his field. Dr. Katz brings with him a track record in this industry that dates to the beginning of Botox and injectables availability – and even before. As a matter of fact, his name appears on the patent application for Botox as a researcher. He’s been working with and examining the product since before its introduction. Plus, he’s a practicing dentist who uses Botox daily. After all, no one knows more about facial anatomy than a dentist. Additionally, he’s spoken across the globe on injectables and Botox, researched a number of products now on the market and has been honored many times for working tirelessly to make injectables safe and accepted. But the skills you’ll learn and Dr. Katz’s talents aren’t all that make this training in Boston so unique. Choosing to train with Dentox in Boston means you get 10 hours of continuing education credit for a course you can actually use to benefit your practice and help secure your future. But you get more than just the credit hours for coming to the course. Receive 8 more hours of CE credit by reviewing online materials that will be provided to you in advance. This includes refreshers as well as videos that delve deeper into injectables than we can manage in a single-day course. All this bonus info – plus the CE credit you get for it – makes the Dentox Botox and fillers class the most valuable available. We recommend that you get to the training venue early, if possible, so you can interact with your peers who will be taking the course alongside you. Each person there will also be investing in their future by taking Botox and dermal filler training from Dentox in Boston. Then stay late if you can for more discussions, connections and planning. When you choose filler and Botox injectables training from Dr. Katz in Boston, you’re choosing longstanding, respected, effective training in a location that’s convenient to all of Massachusetts and beyond. Boston area doctors, dentists and other medical pros are welcome to take this class, get ahead and move forward with a successful new sideline – or start a medical aesthetics clinics. It’s time to take this important career step and change the future of your practice in just one day. Get training that you already know you need from the originator of Botox training while he’s available in a location that’s convenient for you. Sign up now – and take advantage of this unique opportunity that’s coming your way soon. For more information about the Boston Injectables Program, call 858-550-9533, or visit our Botox Training Boston Course Page. This blog post is the next installation of a multi-part series of articles exploring the hidden gems of Dentox’s YouTube channel. Each article briefly explores a pair of videos in each of which Dr. Howard Katz shares his famous tips and tricks. These are the same tidbits of professional insider knowledge that put Dentox courses at the head of the pack in medical aesthetics education. A lot has been written about the entrepreneurial spirit, and what sets folks who build businesses apart from the rest of us. One key component is time spent working in their field. To gain genius-level knowledge of your craft, you need to work long hours for years, and that takes passion. It is a snapshot of this brilliance through experience that you get when you ask Dr. Katz to talk a little bit about the ins and outs of facial aesthetics and his long track record of prosperity in the business. In every causal aside, Dr. Katz seems effortlessly to remark on key components to a successful practice in medical aesthetics. Have a look at today’s hidden gems to see what we mean. In this first YouTube Dentox hidden gem, Dr. Katz shares a key tip about the necessity of assessing the borders of the orbital rim to decrease the most common Botox side-effect (after mild bruising) when injecting Botox around the eyes. The solution is deceptively simple and elegant, but certainly comes from years of practice. We hope it comes in handy for all of our past and future course participants. One of the most frequently talked about parts of the face in this YouTube series has been the forehead. In previous videos, Dr. Katz has covered the importance of fully understanding the relationship between muscles, particularly in the forehead, to maximize the efficacy of treatments. In this next installation, we take a look at best practices for the placement of Botox injections to the forehead for maximum effect and to minimize side-effects. The topic can be complex, as every patient is different, but Dr. Katz boils it down to a straightforward heuristic ready for implementation. It’s great not to have to spend 30 years in professional practice to deliver the very best in cutting-edge facial aesthetics procedures. Take a look for yourself, and let us know if you found the information useful. We’re certain that you’ll see here and in the next installments why Dentox training courses receive consistent 5-star feedback. We’re proud to share our expert knowledge with a wider audience on a platform like YouTube. If you liked this video, you can check out one of our many other “genius minute” and testimonial videos or you can simply check back in here when we share our next hidden gem! For those of us among the medical (and dental) science community, it can become easy to dismiss the trepidation that many folks feel about visiting the dentist or the doctor. We know the value of our service, and, when compared to the tricks the mind can play on patients, it seems clearly misinformed to avoid visits due to such thoughts. But, many can come to dread a visit to any place that may include getting needles. Of course, bedside manner and any of the other psychologically soothing tricks we learn are of paramount importance in addressing such fears. When you’ve been in the business for decades, like Dr. Katz has, you’ve had considerable time to give thought to ameliorating the experience of visits to your office. In today’s hidden YouTube gems, Dr. Katz expresses some simple straightforward tips relating to needles and injections. First up, choosing 30 over 32 gauge needles, though counterintuitive is one easy method for making your treatments more comfortable for patients. Have a look. In this second video, Dr. Katz shares another helpful tip of the day about the importance of determining muscle thickness when deciding on the angle of your injection. Have a look, we promise it will not take more than a couple of minutes of your day to learn from decades of experience. We’re proud to share our expert knowledge with a wider audience on a platform like YouTube. If you liked this video, you can check out one of our many other “genius minute” and testimonial videos or you can simply check back in here when we share our next hidden gem from Dentox’s YouTube channel! When you choose Botox training for dentists in New York from Dentox, you’re taking a big step forward toward better serving your clients and generating better revenues for your practice. With this training, you’re opening the door to serving and earning from clients who might not have come to your practice otherwise. This can help save a declining practice, shore up a struggling one or further expand a dental office that’s already doing just fine. Botox training from Dr. Howard Katz is proven to do these things and more. Providing lucrative Botox. As a dentist trained in Botox, you’re allowed to provide clients with injectable Botox for both cosmetic uses and for therapy purposes, including the relief of symptoms from facial pain, TMJ disorder, migraines and sialorrhea. You’re allowed to work on smile esthetics including asymmetry and gummy smiles as well. Offering the remarkable DentoX Lift. Taught exclusively by Dentox, this LIFT program is intra-oral and supra-periosteal, providing the look of a facelift without surgery or downtime for the patient. Our Botox training for dentists in New York teaches this procedure that you can offer to your patients right away. When performed to our specifications, you can serve your patients by enhancing dentofacial support, improving the proportions and symmetry of their lips and more. Injecting cutting-edge PRP biofiller. Injections of platelet-rich plasma are less expensive than dermal filler injections and provide excellent results that don’t cause allergic reactions. Additionally, PRP injections into surgery and injury sites can aid in healing. With a small upfront investment, you can serve your patients in a way unavailable not long ago – and profit big. Creating a full-scale medical esthetics clinic. Dentists who have completed Botox training for dentists in New York can choose to serve clients by operating a full medical esthetics facility built around dermal fillers and Botox. Make it your primary business or add it to your dental practice for additional success and a lucrative new way to serve and profit from your clients. Botox injection. With Dentox training, you can improve the way your patients look and feel. And in many cases, you can help with medical problems and pain. We teach both cosmetic Botox and therapeutic Botox for relieving migraines, depression, TMJ disorder and more. You can relax tight chewing muscles to relieve blood and nerve compression as well – making a real difference in the health and life of your patients. Dermal filler injections. While we often refer to the course as Botox training for dentists in New York, we include details on more than just Botox injections. We include wide-ranging dermal filler training that can help you improve weak jawlines, plump lips and more. Our training focuses on Restylane, Juvederm, Voluma and PRP injections. And just as we do with the Botox component of our training, we teach you how to inject hands-on using head models and real people. PRP injection. Injecting platelet-rich plasma for healing or as an alternative to fillers is a relatively new addition to our training seminars. Now, you can refine PRP from a patient’s own blood at your dental office or clinic, creating a product that won’t cause allergic reactions and that’s much less expensive than other dermal fillers. Plus, you can inject PRP at surgery and injury sites to help with healing. Taking Botox training in New York from Dr. Katz means you could be among the first dentists in your area to offer PRP. The DentoX Lift. Exclusive to Dentox training and developed by Dr. Katz, the DentoX Lift is a nonsurgical alternative to a facelift that allows you to offer your patients a minimally invasive way to look better. You can perform the procedure in about 30 minutes, making it a highly profitable way to serve your clients. Their jawbone, cheekbones and chin can look better in minutes with intraoral injections performed in a special way with specialized tools. Results are visible right away and can last up to 2 years. Plus, there’s no discomfort and there’s no downtime for the patient. 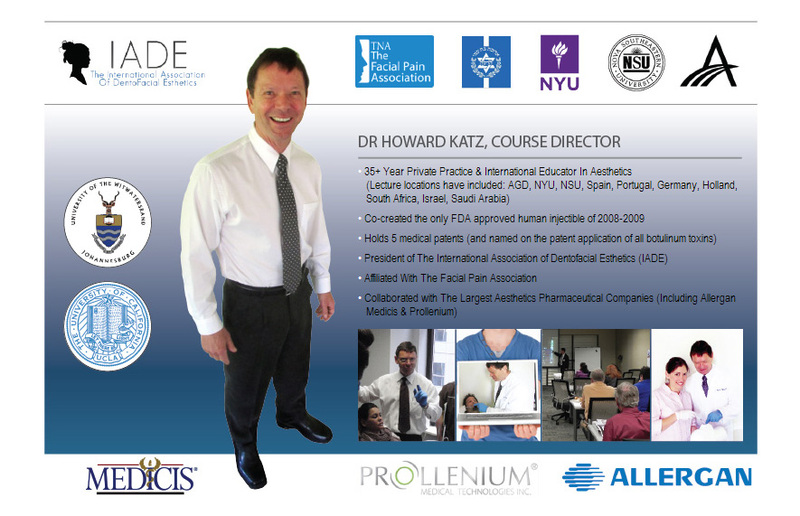 To make sure you have the business skills to take advantage of the injection skills learned in your Botox training for dentists in New York, Dr. Katz also teaches you marketing skills that will allow you get the most possible revenue from your existing clients while bringing in new ones. The result can be a lucrative addition to your practice or a new way of doing business – all the while serving your patients in new and better ways. In addition, the seminar provides you with 10 hours continuing education credit and free access to online follow-ups that can get you 8 more hours of credit. A staff member can attend with you as your model to further expand the knowledge available within your practice. We also provide you with form templates, patient instructions and other documents you can start using immediately. Serve your patients in a new way and boost your bottom line with Botox training for dentists in New York. What could be better for you and your patients? Differentiate your dental practice from others and offer your patients additional services at your location when you take Botox training for dentists in Houston from Dr. Howard Katz. Market your new service offerings as Dr. Katz explains and open the door to new channels of revenue, new clients for your practice and a new career direction for yourself. Does it all sound too good to be true? 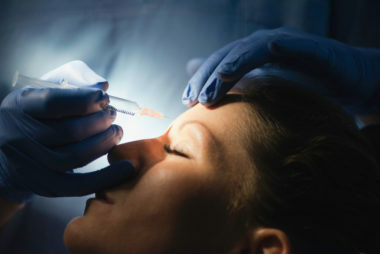 Patients want Botox and dermal fillers and will find someone to do the injections for them. It might as well be you. Inject Botox for cosmetic purposes. When you take Botox training for dentists in Houston, you’ll complete the daylong course fully trained to inject Botox for frown lines, wrinkles and other cosmetic purposes. Smile esthetics like gummy and asymmetrical smiles can be treated in this way too. It’s the primary reason clients will seek you out, and it’s a lucrative business. Inject Botox for therapeutic purposes. Help your dental patients and bring in new ones by helping them with longstanding dental, oral, facial and overall health concerns. Botox can be injected to bring about relief of symptoms from sialorrhea, TMD, facial pain of many different types, migraines and more. Do the DentoX Lift facelift alternative. Taught exclusively by Dentox and Dr. Katz, the DentoX Lift is an intraoral supra-periosteal use of Botox along with dermal fillers to mimic the benefits of a facelift without any surgery or downtime for the patient. 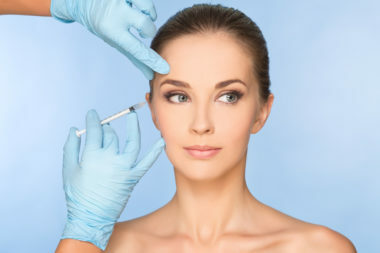 You can complete the procedure in about 30 minutes, and our Botox training for dentists in Houston shows you how to perform this remarkable procedure using special tools that we will introduce to you. Create and inject PRP biofiller. A much-less-expensive alternative to the dermal filler products on the market, platelet-rich plasma is refined in your office from a patient’s own blood. This means there’s no possibility of allergic reaction – and you can do the injections at a lower cost. Plus, PRP can be injected into a surgery or injury site to speed healing. Start a medical esthetics clinic. There’s no need to limit yourself. With our training and your existing expertise, you can create a full-scale medical esthetics clinic based around the many uses of Botox, dermal fillers and PRP. Make this your primary business or boost the bottom line of your dental practice. Botox. Make patients feel and look better and help them overcome their issues when you become your neighborhood’s Botox dentist. Successfully treat migraines, depression, TMD and other medical conditions and rid your patients of deep lines and wrinkles – and prevent others before they happen. With Botox training, all of this and more is possible. Dermal fillers. Also included is dermal filler training for strengthening the jawline, plumping withered lips and even improving the entire skeletal profile. As with our Botox training, you learn hands-on using the staff member you bring with you or a model head. Dermal fillers are temporary but long-lasting, involve few liability risks and can provide dramatic results. PRP. Platelet-rich plasma is a new innovation that we teach in our Houston seminars. Now, technology is available to allow you to create and inject PRP in your office, saving clients money over dermal fillers and potentially speeding healing of dental surgery, oral injuries and more. Because this therapy is relatively new, you could be the first in your Houston neighborhood to offer it, helping you differentiate yourself from the dentist down the street. PRP is created from a patient’s own blood, preventing any possibility of allergy and making it inexpensive to inject once you have the equipment in place. The DentoX Lift. An exclusive procedure only taught by Dr. Katz, the DentoX Lift is a nonsurgical facelift performed through minimally invasive intraoral injections. You can complete this procedure in about 30 minutes per patient, giving them quick results without surgery or downtime – and giving you quick profit. The results are seen right away and can last up to 2 years or more. You and the patient get excellent benefit. Tested marketing techniques. All of these new skills are no good if you can’t get patients interested in them. Our Botox training for dentists in Houston includes proven marketing skills training so you can differentiate yourself from the other local dentists who don’t offer these services. Dr. Katz has years of experience performing Botox, teaching about it and teaching how to sell Botox services. Plus, get 10 hours CE credit, free access to 8 more hours of CE credit through refreshers online and more. We also provide you all the forms you need, including consent and history forms, post-op instructions to give to your patients and more. When you set yourself apart from the field as a Dentox-certified practitioner, expect to see the benefit of your newfound skills every time you check your practice’s bottom line. Take Botox training for dentists in Houston as soon as possible, and differentiate your practice from the competition while serving your clients better than ever before. When you take Botox training for dentists in Los Angeles (from Dr. Howard Katz), you’re not just learning to help a few patients. You’re opening doors to new revenue channels, new clients and a potential new direction for your practice and your career. That’s not overselling; those are facts when you choose Dentox. Offer Botox for esthetic and therapeutic benefit. Provide existing and new clients with Botox injections for both cosmetic purposes and for the relief of TMD, facial pain, migraine and sialorrhea symptoms. Work with your patients on smile esthetics including gummy and asymmetrical smiles too. Administer The DentoX Lift program. This supra-periosteal, intra-oral use of Botox and dermal fillers provides many of the benefits of a facelift with no surgery and no downtime. During our Botox training for dentists in Los Angeles, you’ll learn this remarkable procedure that you can start offering right away. Correct mild Class 2 and 3 issues, enhance dentofacial support, improve lip symmetry and proportions and more. Provide PRP biofiller injections. Platlet-rich plasma injections are a much-less-expensive alternative to dermal fillers that can’t cause allergic reactions and last just as well in the long run. PRP can also be used in your dental practice to enhance healing. Either way, the investment is small and the profit potential is huge. Go full-scale with a medical esthetics clinic in your office. Dentists who complete the Dentox training program are allowed to operate a full-scale medical esthetics facility based on Botox and dermal filler injections. This is a profitable addition to any dental practice and can easily become your primary business. With our Botox training, you can make your patients look and feel younger and help relieve their problems too. Therapeutic as well as cosmetic Botox is taught in our course, meaning you can acquire the skills to treat depression, migraines, TMD and other conditions. You also learn how to relax chewing muscles that can cause periocranial sensory nerve and blood vessel compression. We call our program Botox training for dentists in Los Angeles, but it’s more than that. 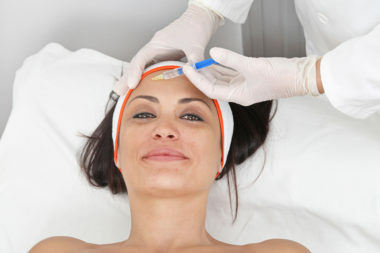 It also includes comprehensive dermal filler training for strengthening weak or aging jawlines, plumping lips and more. The training focuses on injectible fillers including Restylane and Juvederm for superficial cosmetic work and Voluma and PRP for dramatically improving the skeletal profile. Just as with Botox training, the instruction includes a hands-on component to ensure that you get the most benefit possible. Platelet-rich plasma injection is relatively new to our Botox training seminars, but technology is now available to allow you to perform PRP therapy inexpensively in your dental office. When used as a dermal filler, PRP is less expensive for you and the client and can’t cause an allergic reaction. But PRP is more than new kind of filler: It can also be injected into surgery sites and injuries to speed healing. When you take PRP training in Los Angeles from Dr. Katz, you could be among the first to offer this therapy in your area. Essentially, PRP is a concentrated serum created with a special centrifuge in your office from the patient’s own blood – so there’s no product to buy once you have the equipment in place. An exclusive minimally invasive, nonsurgical facelift procedure created and refined by Dr. Katz, the DentoX Lift procedure takes just 30 minutes and can be highly profitable. Enhance the cheekbones, jawbones and chin using intraoral injections and special tools – all while giving your patients a nonsurgical alternative to a facelift. With this procedure, results are immediate, there’s no downtime and the cost for the patient is much less than an invasive facelift. The patient may not even feel any discomfort – and results can last 1 to 2 years or longer before the procedure needs to be repeated. Your new skills are worthless unless you can use them to get more revenue from you existing clients and bring in new ones. Learn to leverage your education in Botox and dermal fillers into a lucrative addition to your existing dental practice and a new career path than can give you an edge over competing dentists. All of this, plus you’re helping people look and feel their best. Additionally, Botox training for dentists in Los Angeles gets you 10 hours of continuing education credit, access to free refresher programs online (which also provide CE credit), the ability to bring a staff member as your demo patient and more. And we provide patient history and consent form, post-operative instruction templates – and everything you need to get started with your Botox and dermal fillers practice. Become a Dentox-certified practitioner and reap the benefits in your practice right away – and for years to come. There is no easier way to enhance your practice than our comprehensive one-day seminar being offered soon in Los Angeles. Why not take the plunge and register now? In the last installation of the blog series, Dr. Katz talked a bit about needles and painless injections. We thought the topic of painless injections deserved its own post (how many of your patients would appreciate anything but?) So, today we’re including painless injections part 2 and 3. Part of what causes the pain in botilinum neurotoxin injections is the acidity of the solution. We’re required to mix the botilinum neurotoxin with saline for injection, and saline has a pH of around 4, which is fairly acidic. So, how do we reduce the acidity of a solution with such specific parameters? As you will see in a minute, Dr. Katz suggests using bacteriostatic saline, which has a less acidic profile (around a 6). Watch the video, and your future patients will thank you. It’s been said that the true test of whether you understand a concept fully or not, is if you can explain it to a child. Notice in these videos (and, indeed all the videos in the YouTube hidden gems series) how concisely Dr. Katz renders his tips of the day. 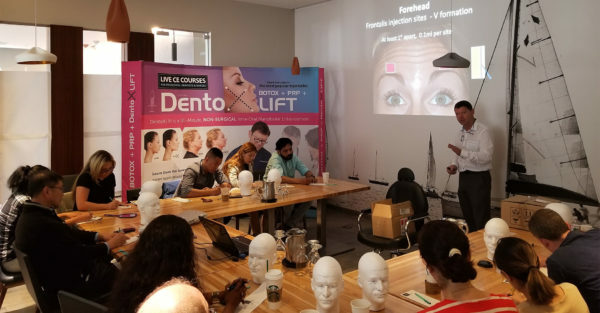 As we have mentioned before, our Dentox training courses, online and in-person, offer a full day of learning that features nothing but the best in medical aesthetics knowledge. Dentox training courses are not sessions in which such above-mentioned concepts are elongated to fill the time; nor are participants subjected to prolonged lectures. Our courses are packed with straightforward learning about the practical strategies and tools for not only succeeding but thriving in this field. We do this by offering only useful and impactful tips, like are presented in Dr. Katz’s videos. It is with the utmost enthusiasm and confidence that we share this learning, but we digress! In his next tip of the day, Dr. Katz discusses another tried and true tip about giving painless injections. In the last two videos addressing pain and injections / needles, Dr. Katz spoke of the importance of angling your injections proportional to the thickness of muscle in order to avoid hitting bone and also simply to use 30 rather than 32 gauge needles to avoid having to replace the needle with every injection. In this final video on the topic, he adds one more crucial component to the latter tip. A thicker (30 gauge) needle is logically going to cause more pain, right? The answer is yes, but you can mediate this by selecting needles with the sharpest bevels. It’s much more elegantly explained in the video below, so give it a watch.